Bruce Wayne survives a harrowing attack by the mysterious Talon that saw his friend the mayoral candidate hospitalized and Bruce with severe knife wounds. The trail leads Bruce to an underground mob group that had to have let the mysterious Talon get to the secret meeting in issue #2 between Bruce and his friend. 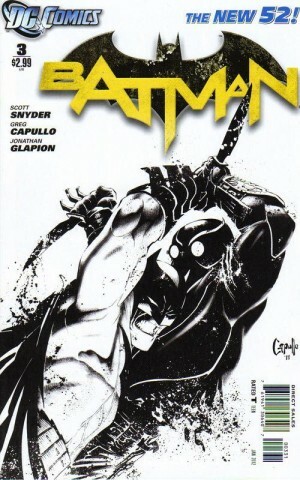 Batman tears through them like a hot knife through butter. Not since the Bane story or the Knightfall have I seen a Batman this driven. Really, not since Miller’s Year One have we seen a Batman so focused. He is starting to believe this Court of Owls mythology, especially as he delves deeper into his ancestor’s past and mysterious death. The Talon is a fascinating and mysterious character, and one who will be very formidable in the battle for Gotham’s future. 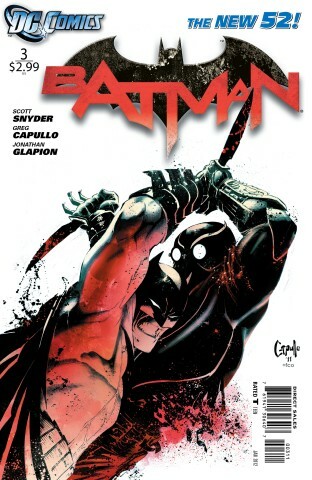 This is by far the best Batbook of the new 52, and maybe the best book of the new 52. The writing again evokes the best of Batman as curious and ingenious detective. The artwork is indeed reminiscent of Year One. At times, the colors and the images remind me of Batman taking on Falcone in year one, the scene with Batman gliding into the fray. Excellent work, although at times in the action scenes there is a little lack of clarity. 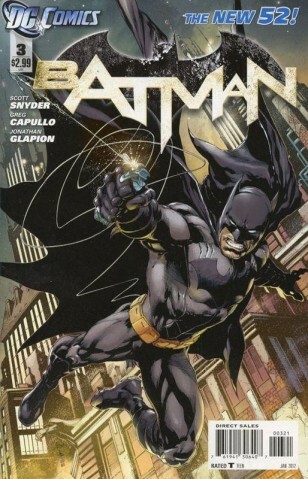 However, overall, this book achieves an excellent tone for Gotham’s guardian. Be careful, Batman, the enemy is in your own midst!